Not sure if this is a Unity or Gwibber issue, although as it's part of the Me Menu, I'm guessing Unity. Clicking on the Me Menu should make the "Status Update" text field become automatically focused. 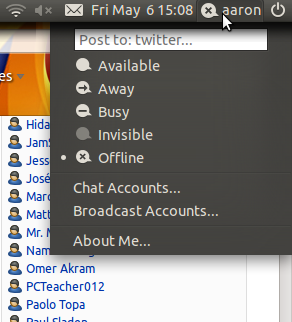 In other words, the first focusable object in the Me Menu should be this text field. Having to click on the Me Menu, then click again on the text field is just an additional and unnecessary action. Okay, but I don't see how it would help in this case. What I mean is that we should be able to click the Me Menu, then start typing a status update straight away. When clicking the Me Menu, we should be able to start typing a status update straight away. are you now facing this or not?? Yes. Do you understand my bug? yes i understand but i m not be able to reproduce it.if any body else having this bug he will comment here.. Thanks for the bug report. This particular bug has already been reported and is a duplicate of bug 641453, so is being marked as such. Any further discussion regarding the bug should occur in the other report. Feel free to report any other bugs you may find.